Holy Guacamole Batman! Check out my article/post on Really Good Stuff! It so super cool to see my name on a "famous blog"! I feel so super awesome! 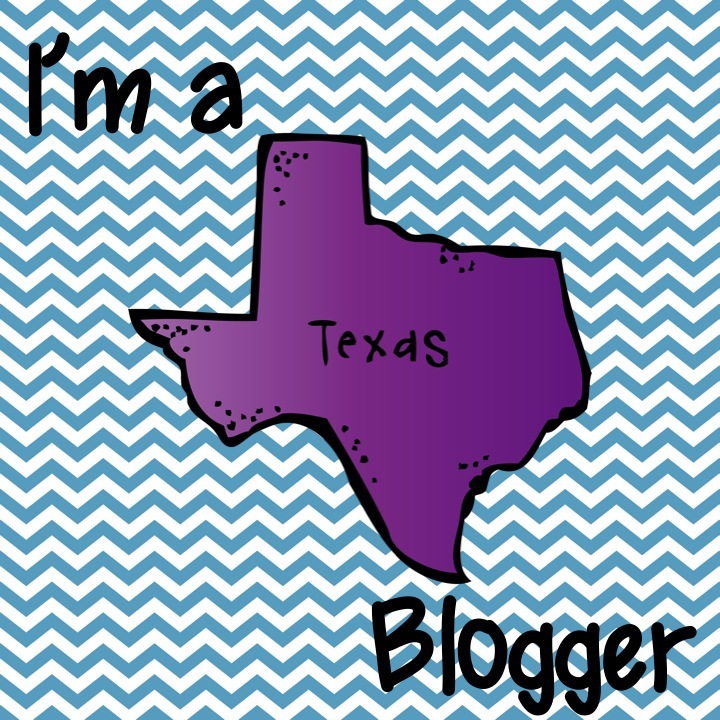 Now on to other awesome blogs! 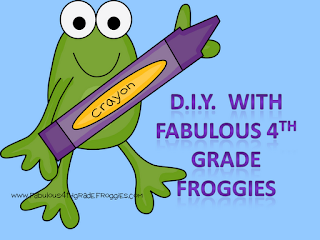 As most of you know I am contributor to the awesome blog Classroom DIY. I post a DIY project that can be used in your classroom on the 9th of every month so that means I have a post today. 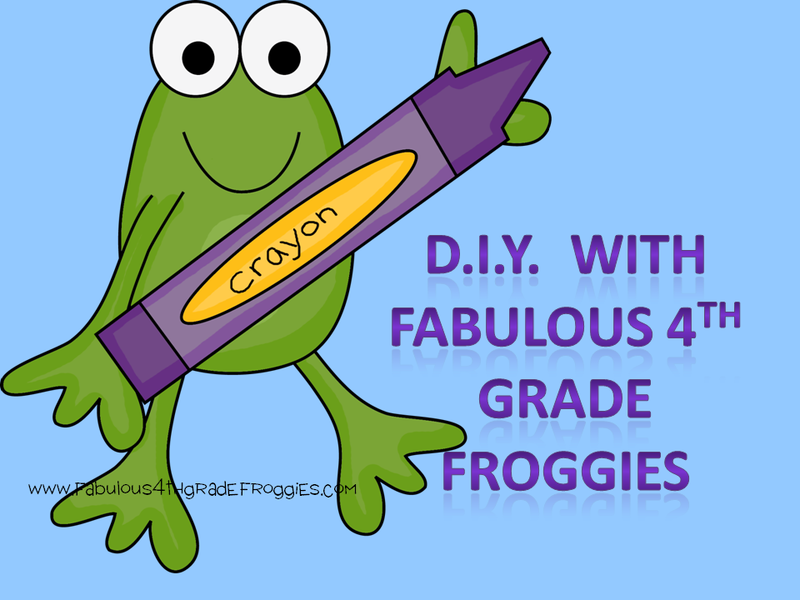 Today's Classroom DIY post is a fun Student Welcome kit (with a free printable). I give this gift to my student on Meet the Teacher night at the beginning of each year and its great in almost any grade. Click here to go check it out! 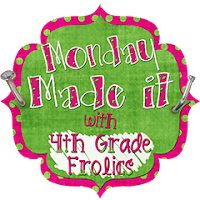 Another reason I am writing a DIY post is because I want to participate in my friend, Tara @ 4th Grade Frolics's, Monday Made it! I love always reading the crafty ideas and thought its about time I join. Saying that I must say, that my Monday Made It projects are very easy and quick. I really am a crafter but all my summer naps, TV watching, blog stalking, and trips to Target have taken up a lot of my time this summer. I promise to show you more of my crafty side when I have more time. The first project is a bathroom pass. I know you are thinking eeeeeewwww GRODY TO THE MAX but these bathroom passes are as germ free as they get. I only allow one boy and one girl out using the bathroom at a time. 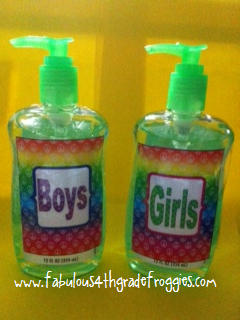 When a student goes to the restroom they take the appropriate bottle of germ-x (either boy or girl) and place it on their desk. Then they go across the hall to the restroom. Having the bottle on the desk does a couple of things.... 1) it tells me who is out of the room and 2) it keeps the "pass" out of the germ infested, stinky student restrooms. Hopefully the students wash their hands before leaving the restroom but on the off chance they don't when they get back to their desk they take a squirt of the germ-x and then put it back where they are kept by my sign in & out binder. I just printed out cute labels and put them on germ-x bottles with clear packing tape. A couple of Mondays ago, I think it was Made it Monday #3, Tara made some binder dividers that inspired me to make some as well. I put all my pics together so they would take up too much space. Of course they match my Peace, Love & 4th Grade Frog theme. Don't forget that if you are in need of a new lunch bag, school tote, or gift, my Thirty-One online party is still happening... Last day to place an order is July 15th. There are fabulous prizes to be won and those will be announced on the 16th. Check it out here! Cute labels! Thanks for sharing! Oh. My. Goodness. I love your bathroom passes! Genius! 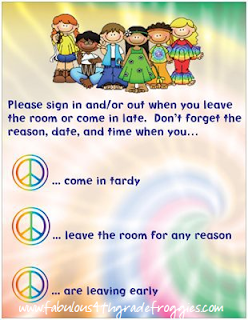 I love the bathroom pass idea. It is nice when the pass is actually on the students desk! Great idea. I am one of your newest followers. I would love to have you drop by for a visit. The article was EXCELLENT Lorraine--congrats!! 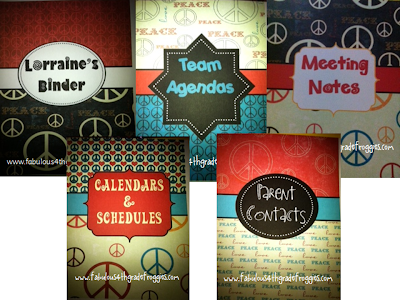 Your binder dividers are cute!! I really like the vintage look! I love your idea for bathroom passes too!! I'm planning on doing the same thing for my classroom! The sanitizer passes are the most genius idea on the planet ever...just saying. I've seen this idea and absolutely love it! :) I love your blog as well! I've been stalking it for awhile now and finally decided to make a blog of my own ! Feel free to check it out! :) Ps. I will definitely be making some of those "Student Welcome Kit" bags as well! So cute. I love the bathroom pass. This is such a great way to see who's gone and keep germs at bay.